As I used to make a video montage on returning from each of my trips, I decided to invest in a stabilizer to produce better quality plans. I compared all the products on the market and it was a promotion on Amazon that took me a step further. I hesitated for a long time before taking the step because I had certain requirements for this type of product. 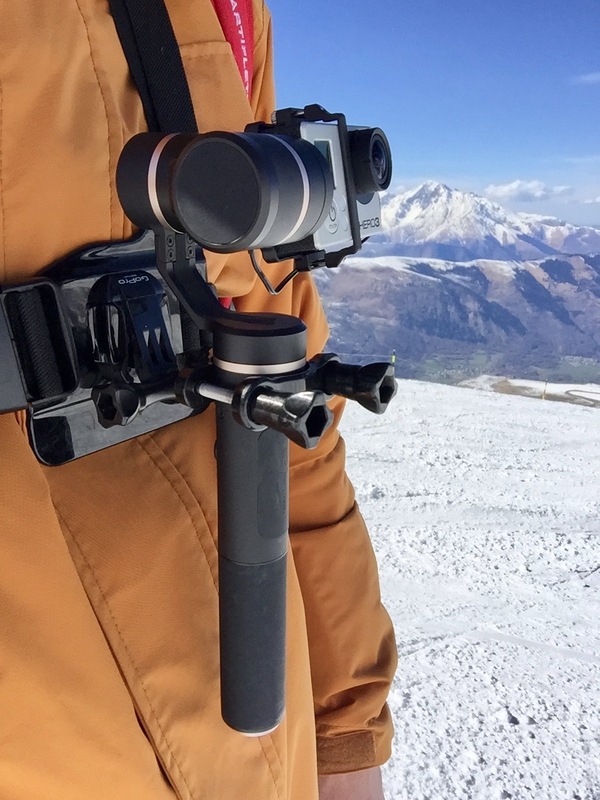 The Removu S1 seems to be the ultimate gimbal because it can be used with a handle in pole mode and also without the handle to be fixed on GoPro bindings (helmet, chest harness…). It is also water-resistant. The big problem is that it is horribly expensive (379€ more than the GoPro Hero5!). It has been financed by the Indiegogo crowdfunding platform and since its release, it is only available on a drop-by-loop basis. These two stabilizers share another flaw, they were launched by brands for which it is their first product of this kind so there is no return of reliability from previous models. 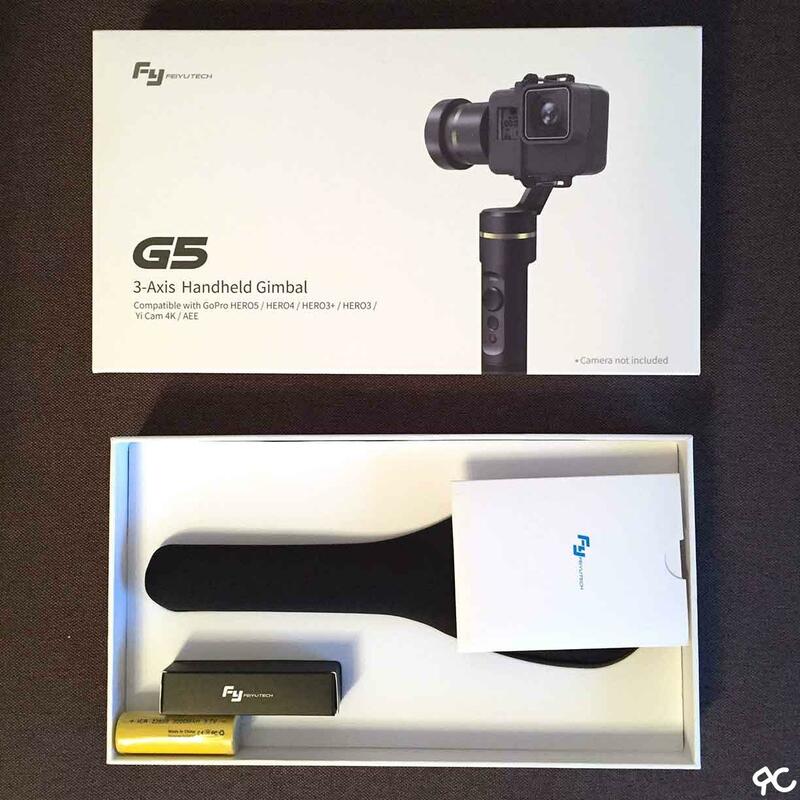 The Feiyu G4S and G5 are very similar. 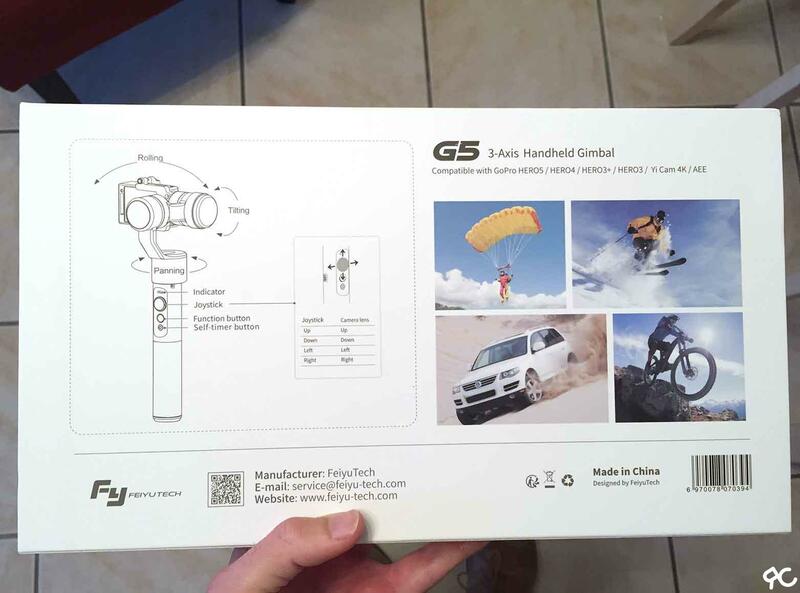 The Feiyu G4S is the product of last year and the G5 its successor. The G5 is water-resistant, unlike the G4S. I chose the G5 for its water resistance and compatibility with the GoPro Hero5, which I don’t own but which gives a glimpse of the design of the Hero6 (which I will own). So it’s the ultimate product for me: together with the future waterproof Hero6 without case (like the Hero5), I could attach it to the chest harness for my skiing sessions and I can use it during my travels with its handle and joystick very useful for panoramas. I took advantage of an flash sale on Amazon to order the Feiyu G5 from a third party seller but shipped by Amazon: 235€. 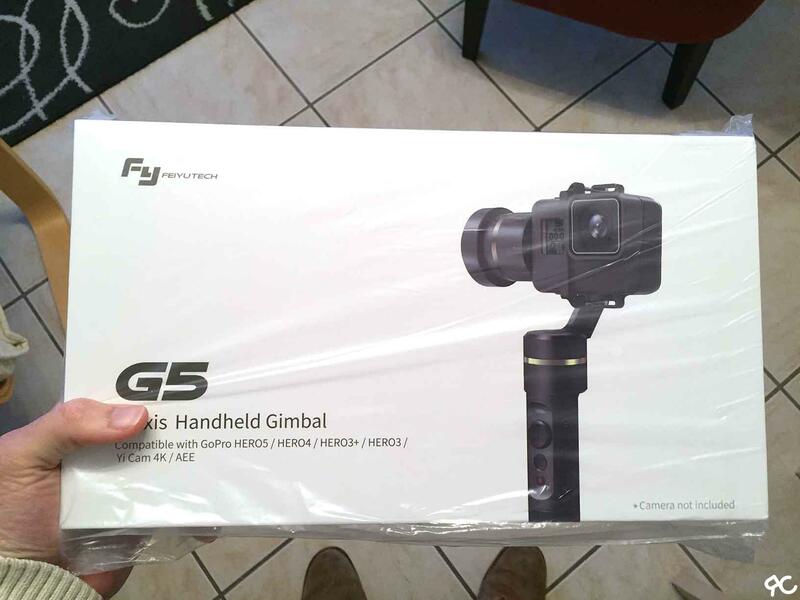 The G5 stabilizes on 3 axes and up to 360°. Mode “follow direction” (default mode): you fix the camera axis by tilting the boom. The camera shoots towards the pole whether you turn it or tilt it. For example, if you want to film your feet, you point the pole downwards and the camera tilts at the same time. “Lock” mode: it is activated by clicking on the configuration button and is used to lock all camera axes. It will always shoot in the direction you have locked even if you turn or tilt the boom. Mode “Mode followed by direction and inclination”: it is activated by double-clicking on the button. The camera remains stable horizontally and follows the direction and inclination of the pole. “Selfie” mode: it is activated by holding down a specific button. The camera rotates 180° and returns to the opposite direction as soon as the button is released. There is also a procedure for resetting horizontal stabilizer horizontality. Just put it on a table and make a button combination, it has the effect of resetting the motors. I have not yet had the opportunity to do so because I have not been confronted with this problem. The first time I tested the stabilizer, we heard the engine noise on all the videos. I fixed the camera in the other direction (head down) so as not to put the microphone of the GoPro Hero3 on the motor side and the problem is solved. For the GoPro Hero5, Feiyu also recommends activating the wind reduction mode. Here is a small video of test where I fixed the GoPro on a classic pole and then on the Feiyu G5. I ran and the difference is striking! I found a very useful tuto to attach it to my chest harness from the tube / handlebar attachment (which I used to attach the GoPro to the ski pole until now). The trick is to cut a “tooth” out of the fastener so that it can be attached to other GoPro fasteners. The problem is that these are two “male” fasteners so they don’t fit together. By sawing a tooth, it is transformed into a “female”attachment. I was finally able to go skiing with the recent snowfalls in the Pyrenees. Here is a picture of my “installation”. I used the tuto above to attach the Feiyu G5 to the GoPro chest harness. Here is a small extract of what it gives in video skis to the feet! 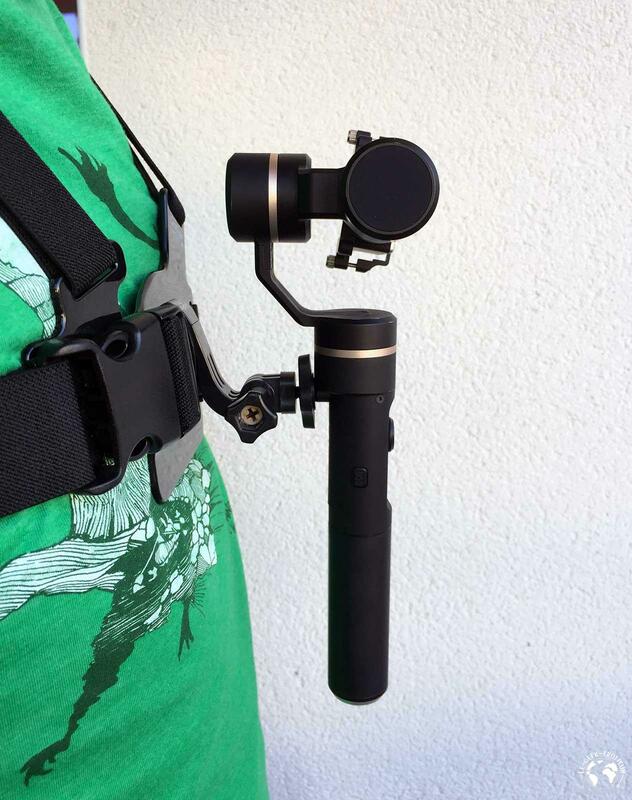 If not, you have another accessory to attach the Feiyu to any GoPro attachment including the harness. 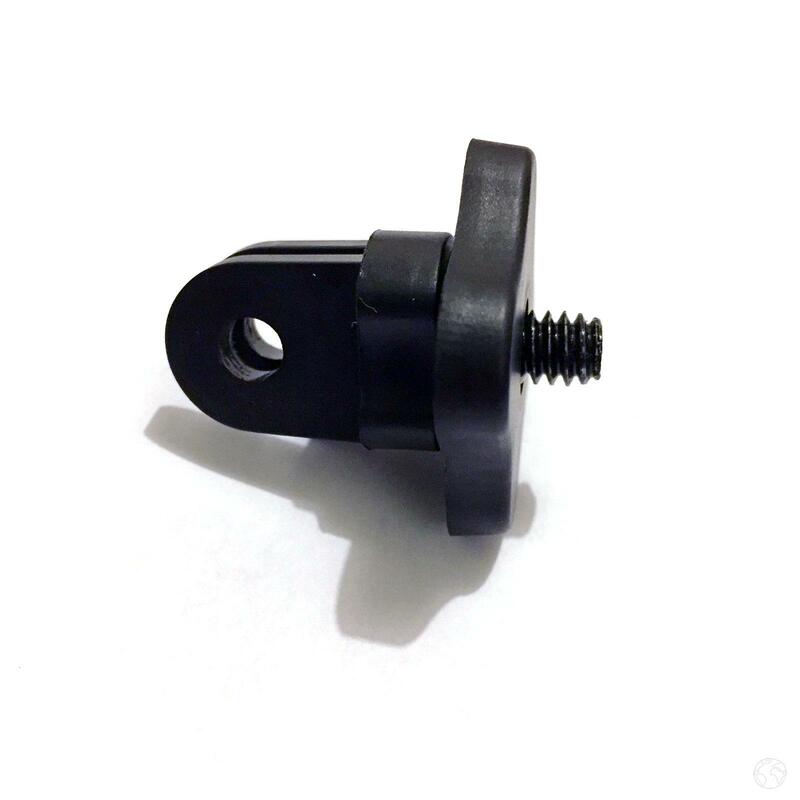 This is a 1/4 “screw adapter/connector. 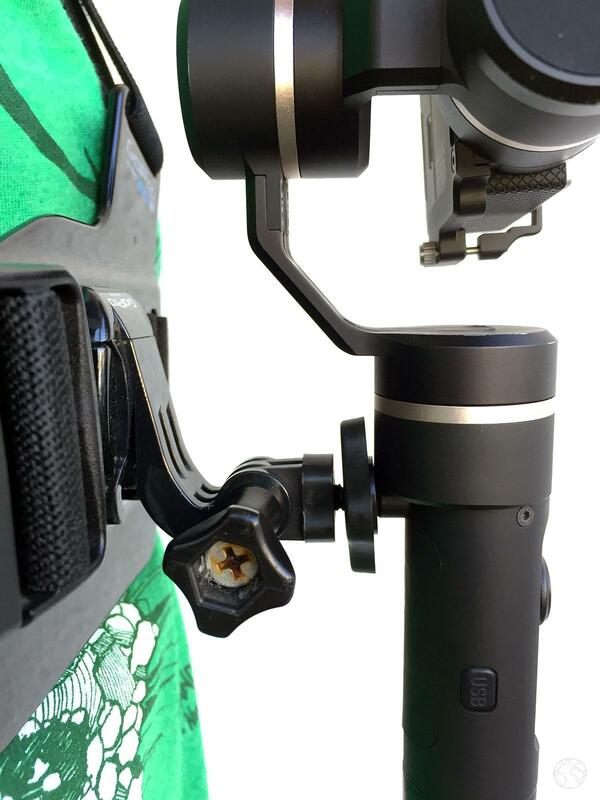 The Feiyu has 2 places for 1/4 screws: below the pole and on the back of the pole located at about 3/4 of the top. It is much more practical to fix / unfix quickly the pole so I advise you to start on this solution. I can’t wait to test it in real conditions on the slopes this winter! You also have a stronger adapter in alu, which is more secure but a little more expensive (but good considering the price of what is fixed on it…). Otherwise you have what seems to be the same version on Bangood or AliExpress but the delivery will be much longer (but the price is much cheaper!). 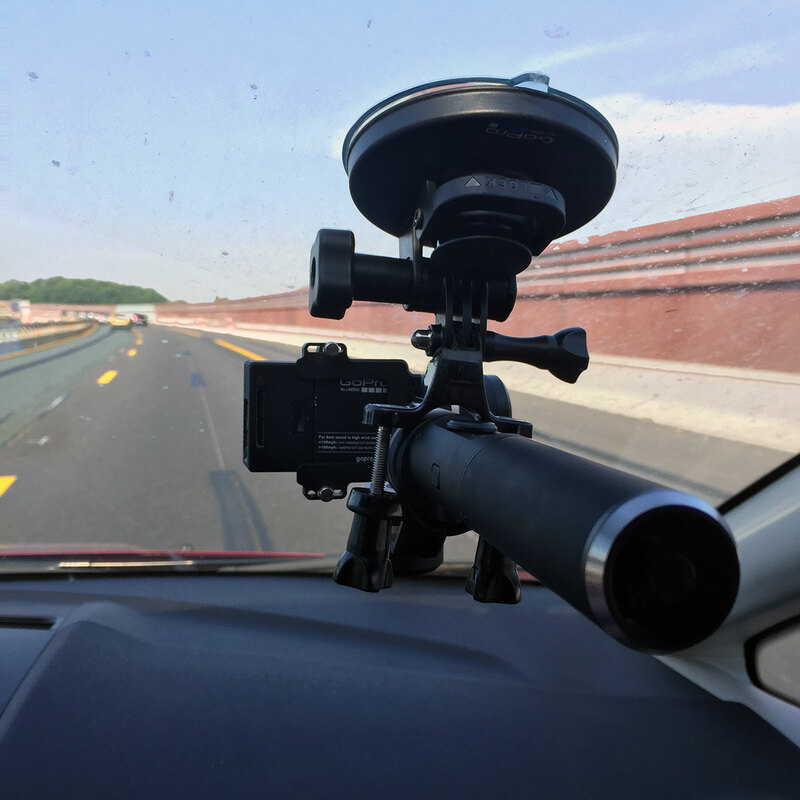 In view of my future road-trip to the States planned this summer, I bought the GoPro suction cup to fix the Feiyu inside the car. I tested the installation last weekend and it’s a killing! The video is super stable, that’s great! We can do super fluid accelerations. I had the great pleasure of having the GoPro Hero6 at my birthday so I was able to go and test it on the ski last month, all in 4K 60 fps (some rushes are in 2.7K as I also tested the built-in stabilization of the last GoPro, and it is not possible to activate it in 4K). The integrated stabilization is quite impressive, not at the level of the Feiyu but quite frankly it can be enough in 70% of the cases (by walking for example). I put the GoPro on the helmet and nothing to do with the previous GoPro! It’s still moving a little, but it’s not spinning! The top is of course the combo Feiyu G5 + GoPro Hero6, all resistant to water (and snow) and in 4K 60 fps! Next time, I have to think about tightening my chest harness a little bit more because I have some weird tremors that I didn’t have before. I’d have to re-test it at the next session to see if it comes from the fact that the harness was “walking around” a bit or if it comes from any stabilization of the GoPro that short-circuits the stabilization of the Feiyu G5. I finished editing the videos of the American road trip this summer: New York, San Francisco, Yosemite, Las Vegas, Grand Canyon, Los Angeles. I put you the playlist of the whole road trip, you will get a glimpse of what the Feiyu gives in the final result both by car and on foot (and even running sometimes). During this trip, I noticed that the Feiyu, with the GoPro Hero3 mounted on it, tended not to keep the horizon straight. I haven’t had this problem (or very, very rarely) since I used the Feiyu with the GoPro Hero6. I also noticed that in the car, at each turn, the Feiyu inclines more or less strongly because of the force G. I think it is a perfectly normal operation but that is to say.